Spring has officially begun and with it comes renewal and rebirth in the garden. As much as one tires of the dark, freezing days of winter, would we be so thankful and welcoming of spring if it were not for the season before? When something is present all the time, we tend not take the trouble to appreciate it on a regular basis. Just look how often we take the people we love for granted. Or the luxury of having not just running water but hot water when needed. Think how your penchant for iced tea would suffer without the easy abundance of ice within arms reach. How frequently we fail to be grateful for the daily necessities that make our lives so livable. 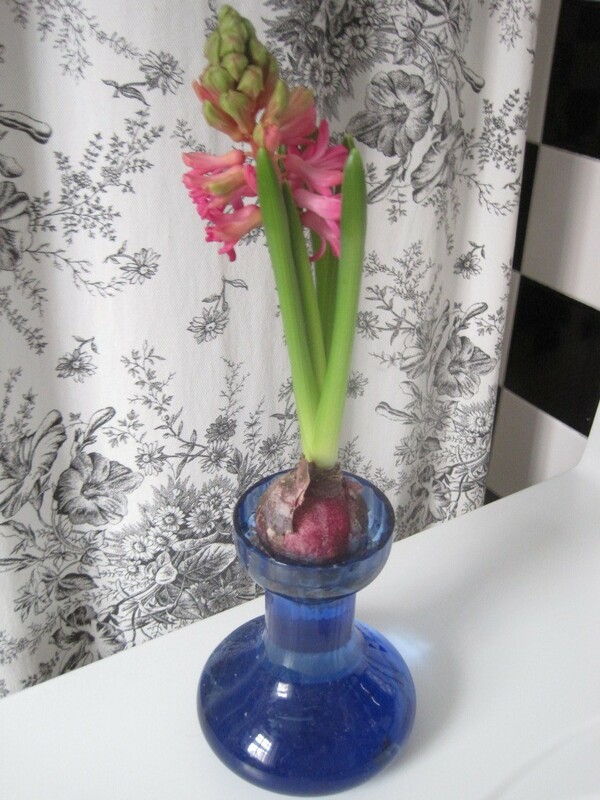 Even more overlooked are those details like a friendly smile, a newly opened flower, freshly laundered sheets, early morning birdsong; things that though not entirely essential, lend joie de vivre to the dailiness of our lives. 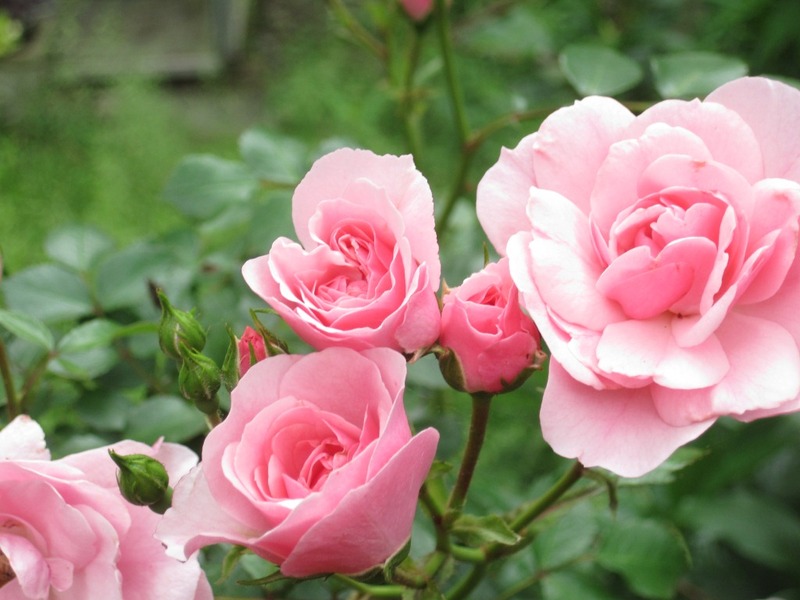 And so it is with the propensity one sees these days to have the ever blooming rose, the eternally immaculate, “no maintenance” lawn, the ‘instant’ tree or best of all, the effortless vegetable garden. If anticipation itself is half the pleasure, then the well-timed rose completes it don’t you think? To expect eagerly and then applaud the flowers that bloom but for a specific span of time cannot in any way compare to what is in flower all the time. We simply get used to things till we no longer notice them. The local, sun ripened strawberries of late spring cannot be matched by those imported at other times of the year. If we had firework displays all the time, would the fourth of July still feel special and celebratory? Everything has a season for good reason. The high price of a pristine lawn and the harm to the environment can hardly be worth losing the earliest sources of nectar for bees and hummingbirds – the much maligned dandelion. Much is sacrificed in the effort to keep that lawn just so that ,we’ve forgotten the birthright of children and animals to play there, pick grass to make a whistle, bury a bone or other treasure, search for four-leaved clover without worry of the toxic effects of weed killers and pesticides. Disregard for the moment, the expense of planting a mature or almost mature tree ( they are called ‘trophy trees’). After all, if one has the funds, why must a person be judged for how they spend it. It the foregoing of the utter satisfaction of watching a young sapling evolve into an impressive tree that is the true waste. So what if it takes too long for a baby tree to become an adult tree? Would we not think it a pity if we missed out on the years it takes a man-child to become a man? Think about it. And then, with the money saved, a multitude of whips can be planted instead: to create an alley, a grove or an orchard. What exactly is a low maintenance vegetable garden? Does that mean not enough care was given to the plants? 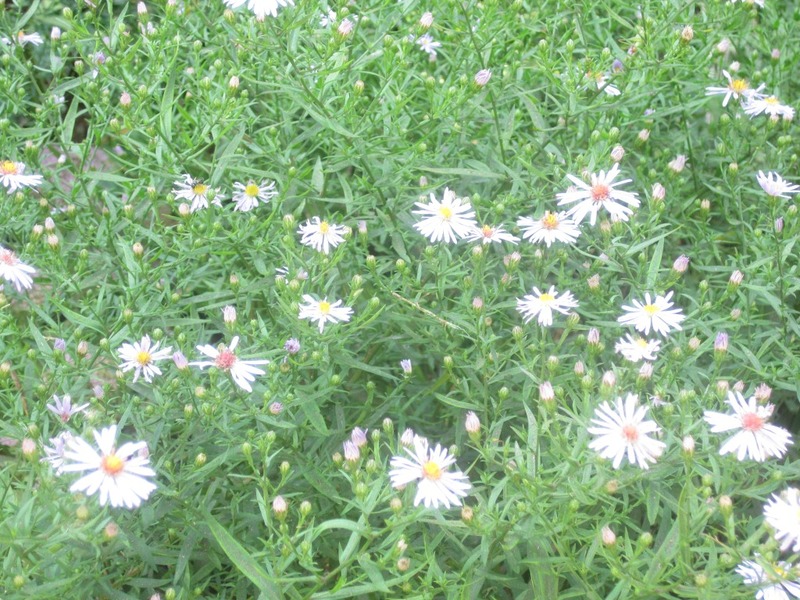 Were the plants compelled to jockey for space with rampant weeds? Or maybe no sleep was lost when pests ate up a good portion of the crops. 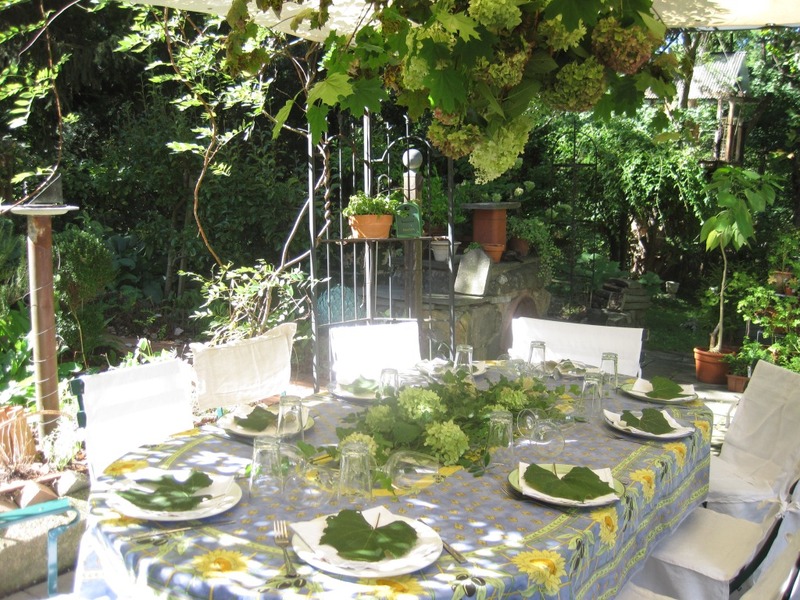 To get healthy, abundant vegetables, regular watering, weeding and organic pest control is de rigueur. Besides, if it were that easy, would you have the same pride when putting food cultivated by your own two hands on the family table? Gives one pause right? Assuming one implements time and sweat saving practices, how then are those purloined hours spent? I’d be ecstatic if they were passed in noble pursuits like face to face conversations with family and friends, a pick up game with the kids, volunteering for community services or hardest of all, spending time being creative sans anything digital for assistance or company. A better approach is to acknowledge that we are but small cogs in the big wheel of life. Invite the gifts that nature has bestowed upon us. Sunsets, rainbows, birds, butterflies, flowers, fruits, fall foliage, snow, rain, rivers and lakes, oceans, mountains, forests, prairie and, most precious of all, each other. There will be storms, droughts and the occasional locust invasion. Accept them. We’re meant to live in harmony with nature. Each day comes laden with its own pleasures, treasures and choices. Choose wisely and you will partake heartily of the day. Lets make this a true beginning, an honest spring. I’m in love with Heuchera. This is not a love that made me swoon and swept me right off my feet but one that has grown from a long friendship. A friendship that came about by sheer happenstance. Isn’t that the way so many good relationships develop? When we aren’t trying too hard or analyzing too much, when we’re more relaxed and open to receive what or who comes our way. And so it was with me and Heuchera. 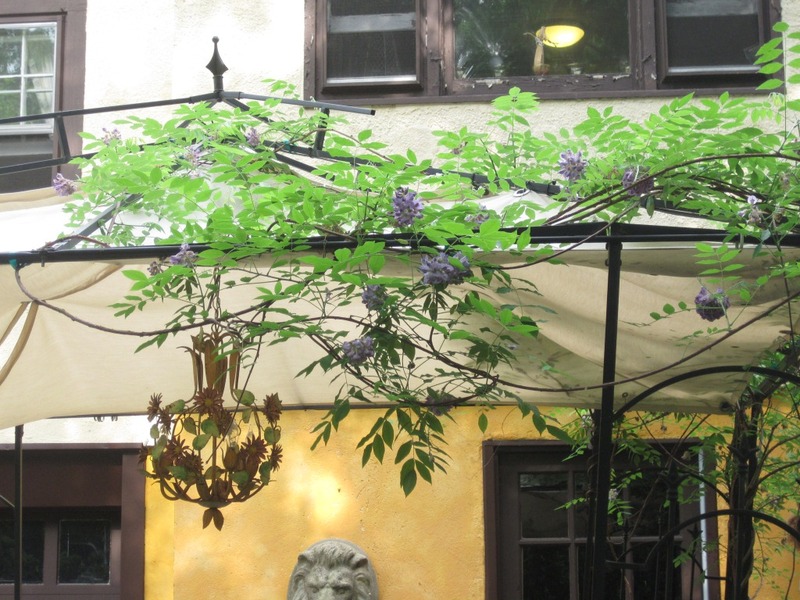 Several years ago, I was trying to add visual oomph to an oft overlooked, shady part of the garden. Amongst the assorted greens, I added the almost acid yellow of Hackonechloa grass and needed a dark color to balance this palette. 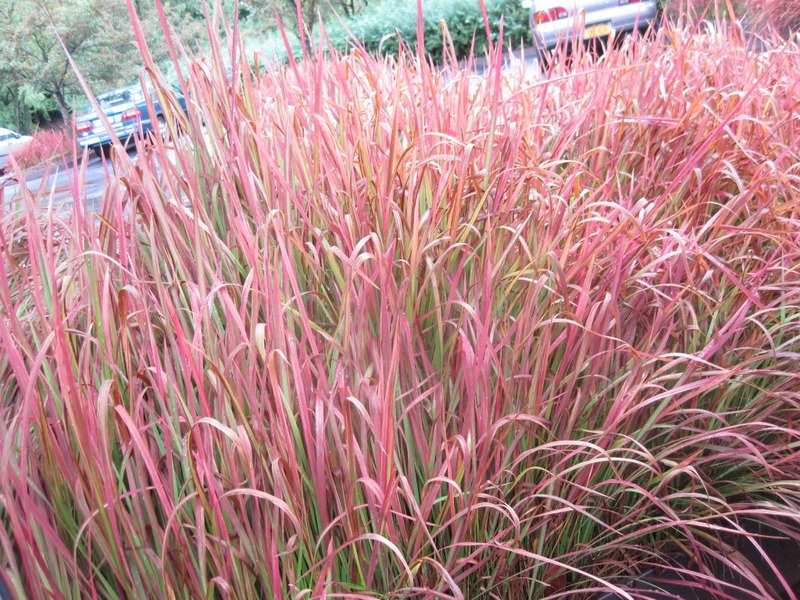 Shade tolerant, purple or burgundy hued, low to medium height and easy to grow were the characteristics that were required. 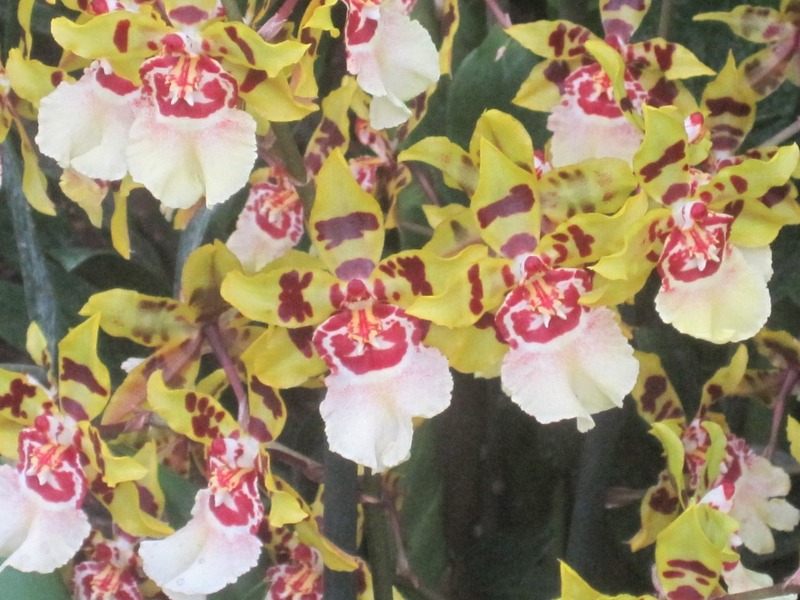 At the nursery, as I trolled the aisles of happy perennials screaming “pick me!” and trying hard to suppress my impulse to adopt them all, I came across a plant that appeared to fit the bill. 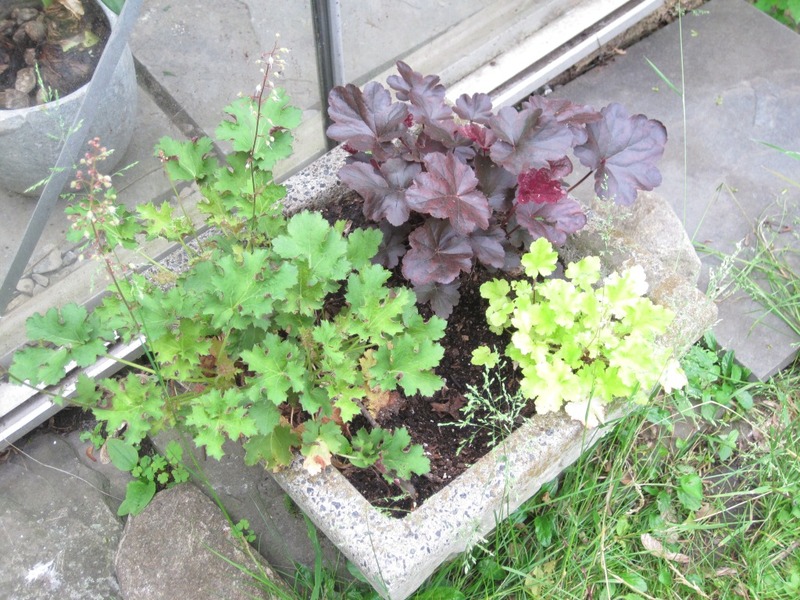 That was how I first met Heuchera. Rosettes of obsidian, palmately lobed leaves and quite unpretentiously handsome overall, it was ideal. An appropriate addition to the garden. Once I realized how dependable this newcomer was, I looked for more to fill in various shady corners of the garden. To my sheer delight, I discovered that Heuchera come in a variety of shades ranging from dark to chartreuse to variegated. A multitude of hybrids between various Heuchera species has been developed. One could make a whole bed of the many Heuchera to create a stunning botanical rendition of a Flemish tapestry. Commonly called coral bells, because of the coral colored flowers on long racemes that rise well above the main body of the plant, Heuchera are not generally selected for their blooms. Its the foliage that make them so interesting and vital. FYI – the flowers also come in white, green and red colors. That they are hardy, virtually pest free, shade loving and easy to propagate by division only increases their value in the garden. 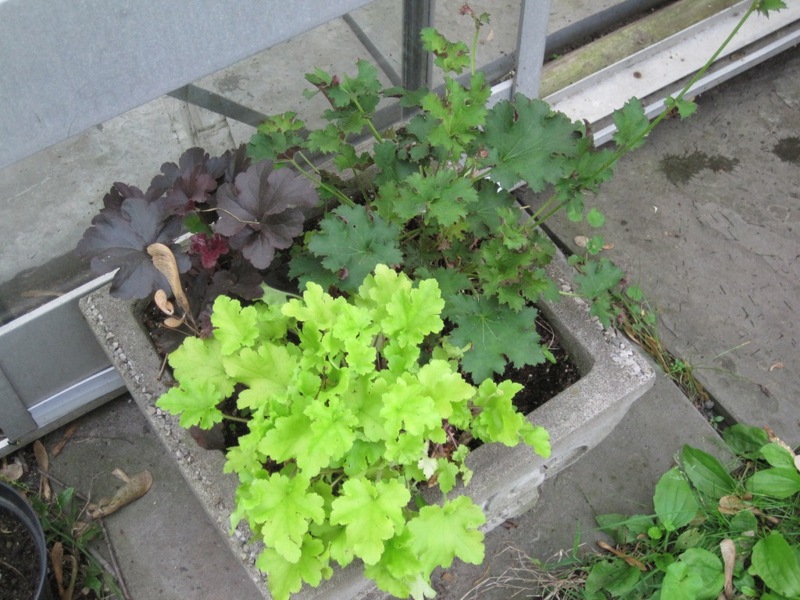 I’ve had Heuchera in pots that stay outside and unprotected all winter and to date, they have survived remarkably well. That is impressive don’t you agree? But wait, it gets better. Heuchera are true North American originals! They grow in different habitats so there’s something for a garden anywhere in the world. The leaves are edible though I have not been inclined to nibble at them. Natives of the American northwest used to make a digestive tonic from the roots. Again, I’m not recommending that anybody try out a recipe. Though personally, I’m happy to know that they are standbys in case of famine or a sudden inclination towards gluttony. With a truly extensive array of blossom sizes, shapes, colors, foliage types and geographic range, they are quite valuable in any garden. Besides, who can resist cultivar names like ‘Burgundy frost”, “Raspberry regal”, “Smokey rose”, “Purple petticoats” or, “Chocolate veil”? I do believe this love affair is for keeps. I caught a glimpse of Spring last week. 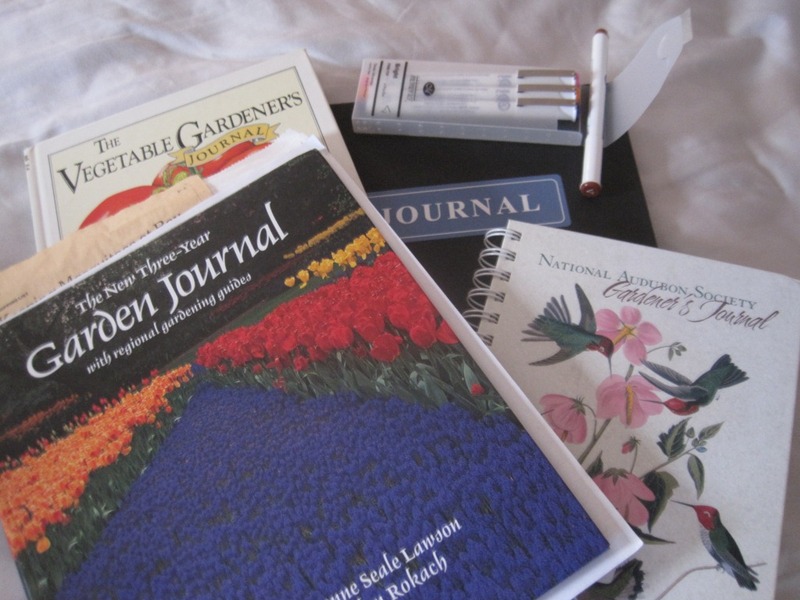 Since we are planning and preparing for a new season of gardening, now is a good time to start keeping a garden journal. Putting down ideas, plans, designs, progress, day to day horticultural happenings are extremely useful and enlightening. My paternal grandmother wrote a diary every day and I remember being very intrigued by that. She never encouraged me to do the same but I must have inherited the journaling gene because since my 20s, I have always kept journals. At first it was about my life in general – I vented, ruminated and, celebrated all the goings on. I wrote about my hopes and plans. The pages of my journals bore witness to my tears over disappointments, pride over triumphs and mostly a whole lot of mundane rubbish. As a scientist, I learned to keeping meticulous notes of my work on a daily basis. Once I acquired some land on which to garden, maintaining a log of my activities combined with my observations and thoughts was natural. Keeping notes leaves nothing to memory which is notoriously unreliable. The records allow for comparing, referencing and following the progress of the garden over the years. I’m always shocked by how inaccurate I am when remembering something that occurred in the garden. My garden entries are testimonials to this fact. 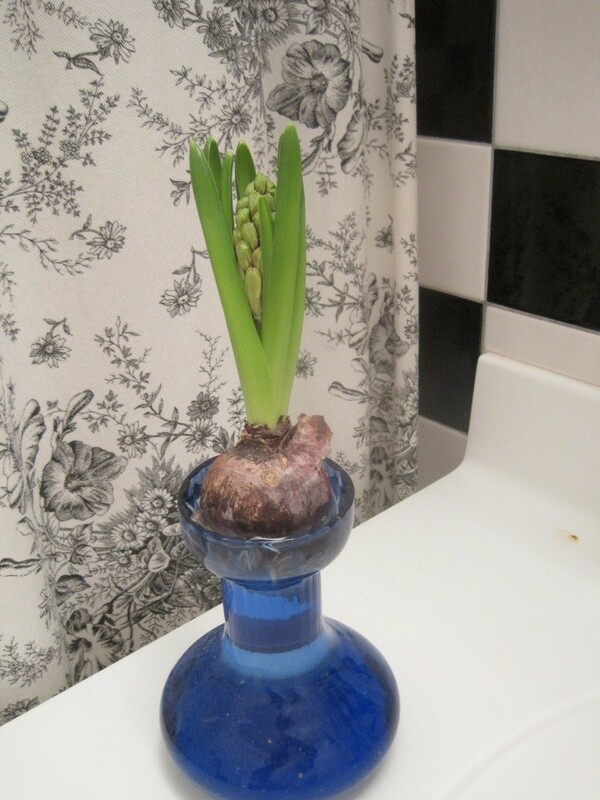 I’ll be informing no one in particular about the delay in or early blooming of certain flowers only to read that the pattern is exactly the same as before. 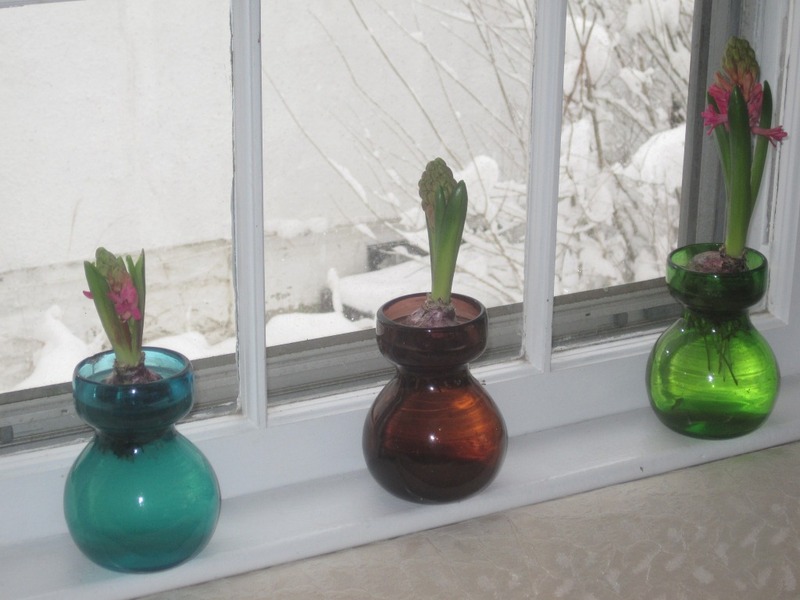 The same for how I recall the weather and how it affected my garden. If word of how poorly I recall these matters got out, those who must deal with me on a regular basis might rethink the association. But the truth is, most people have the same problem. Hence, it is well worth the time and effort to write down all relevant points. Tasks, expenses, opinions, successes, failures, ideas and dreams all get written down. What is in bloom or in fruit, what the temperatures have been and how much rain has fallen are noted. Pests and problems are lamented. Nothing at length: just succinct reporting. There is the most to write about during the busy season which of course means there is the least time available to do so. I have often lapsed in putting down all the garden goings on and lived to regret it. A forgotten brilliant idea is plainly useless. I do take lots of photos and they are incredibly helpful. 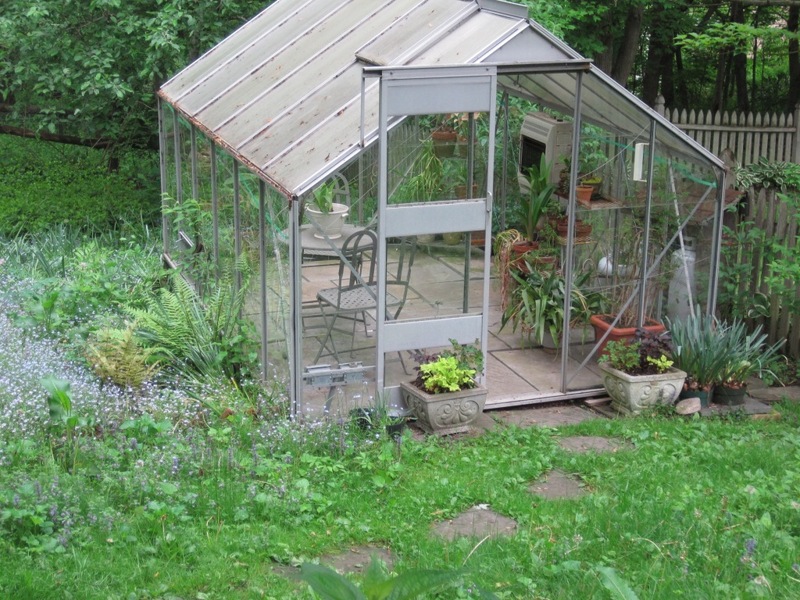 But like a doting parent, I tend to capture the garden only when it is on it’s best behavior and not when it is throwing a tantrum and presenting itself in a weedy, pest ridden state. Amends are being made and I have begun to capture those not so proud moments. Photos do not however convey emotions, opinions and dreams. What I think I must do, might do, want to do can’t be surmised from an image. So it is still necessary to record those down. Journals don’t get written with a view to leaving a legacy but there is a part of me that harbors the thought that perhaps one day when this piece of earth is no longer mine, my writings will enable the next gardener to understand why, what and how it used to be. What would be interesting is to see how influential what goes on in the garden has on my writings in my personal diary which, over the years has become more reflective and less self absorbed. Did I write deep, poetic and/or witty thoughts the same week the garden looked great and all the related tasks got done? Do the seasons in the garden parallel the seasons in my life? I’ll bet there is a direct correlation but, I’ll set that project aside for now. There is much else to get done. 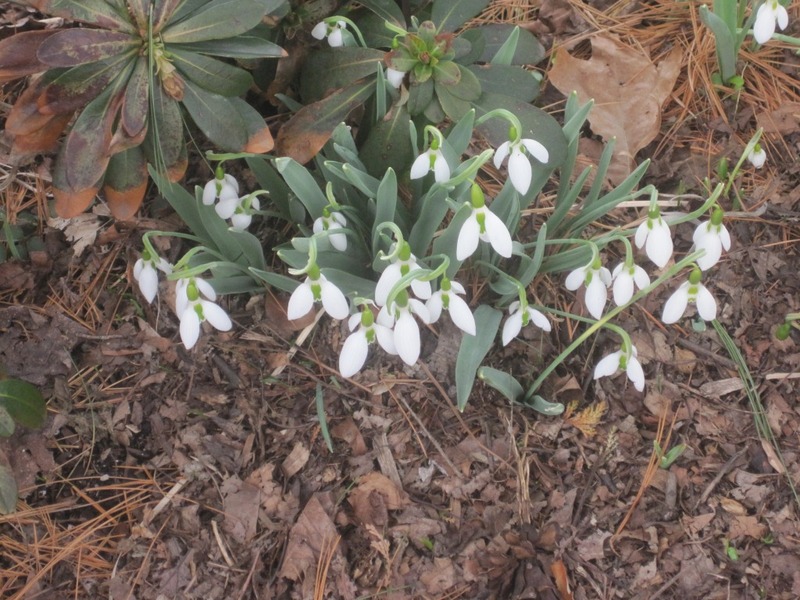 Goodbye winter weary February, hello March! Coming alive with all the trappings of hope and optimism is the theme of the month. Look around. The evidence is everywhere. 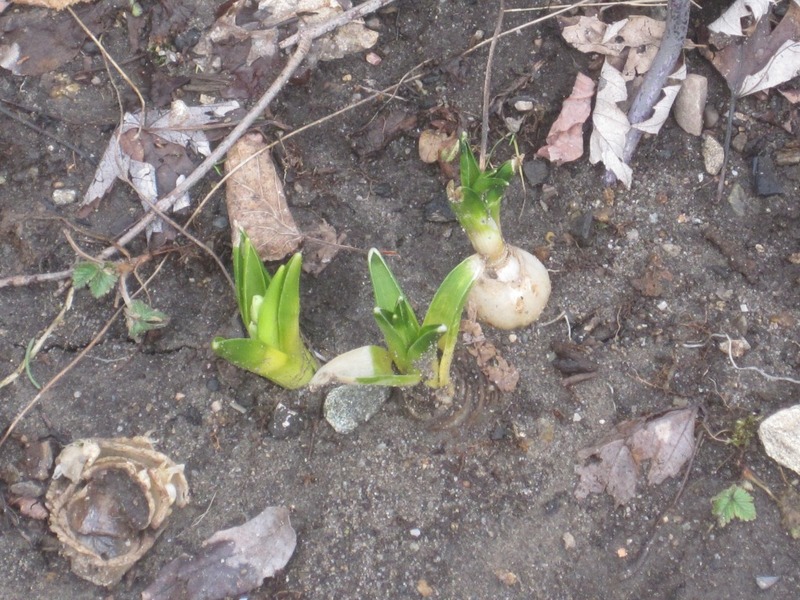 Bulbs determinedly pushing their way through the frozen earth, the willow trees turning an ocher yellow soon to be replaced by sap green, forsythia bushes studded with fattening buds of burnt sienna. 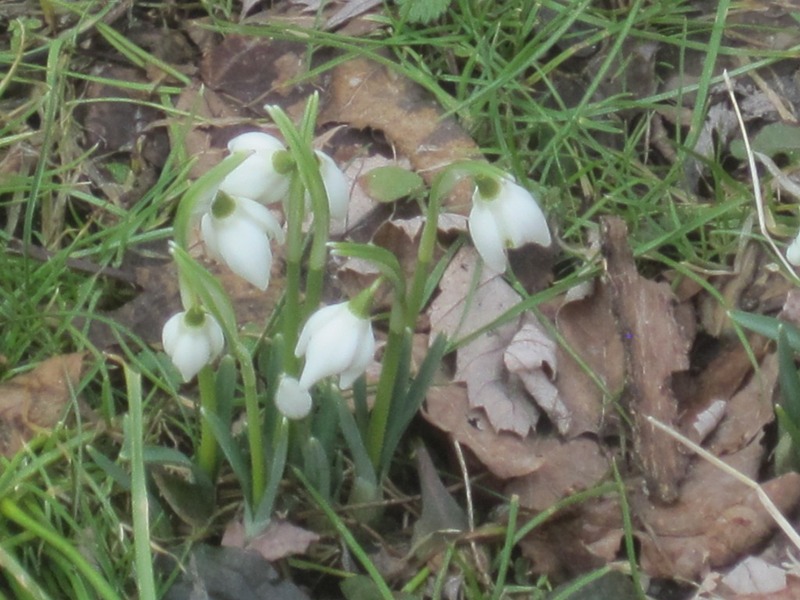 I go on treasure hunts of my own – Spot the Snowdrops and Unhide the Hellebores. 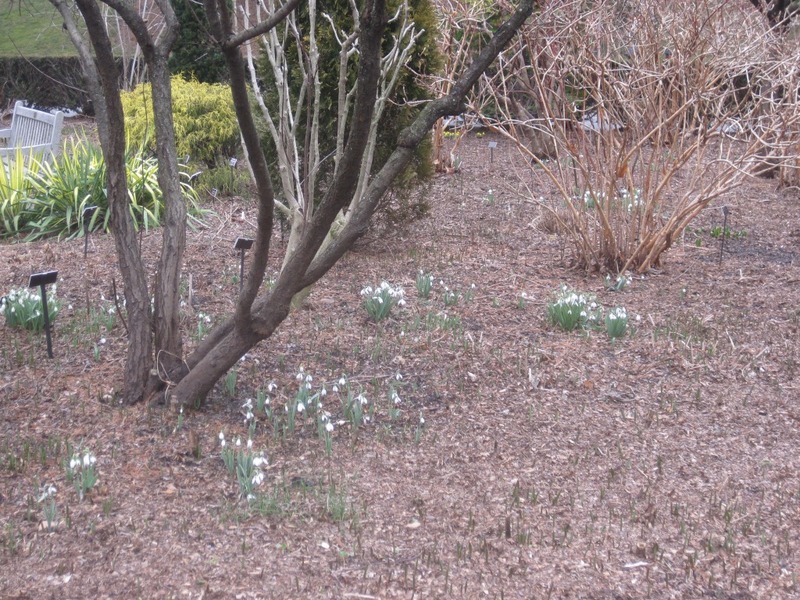 This past Friday, in celebration of it being the first of March, I went on a reconnaissance of my garden. 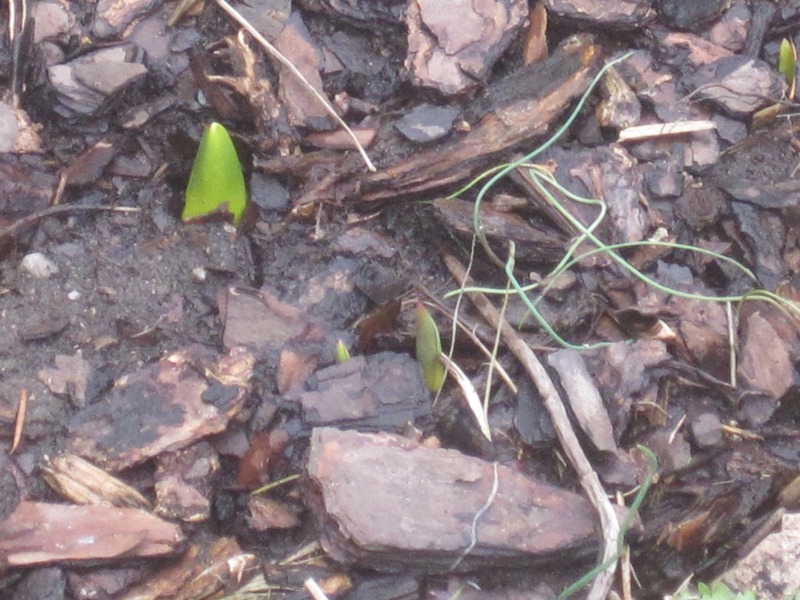 In the midst of patches of grass left exposed by the last snow melt, I spied the earliest of the snowdrops! A sight that never ceases to thrill. I rushed to check the hellebores. Sure enough, sweetly nestled beneath the protective mantle of last year’s leaves were buds galore. 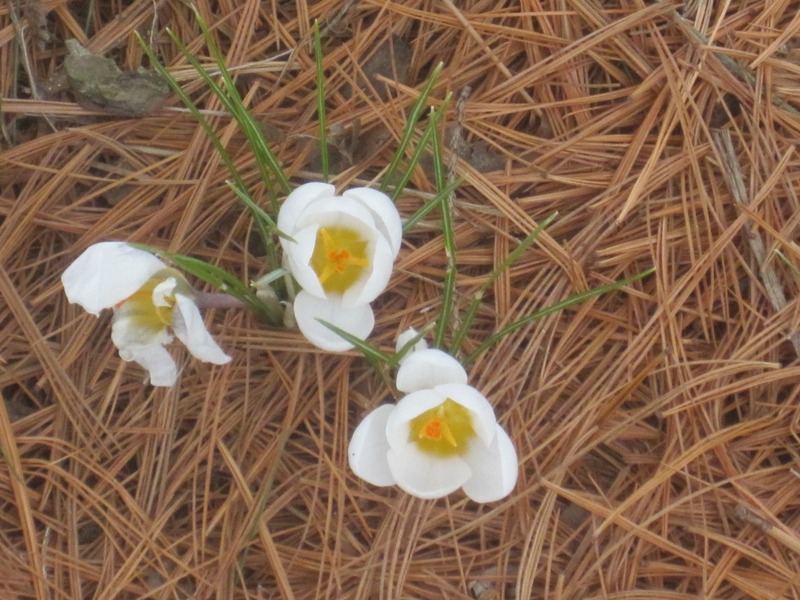 Firm assurance that spring was well on its way. In the greenhouse, the primroses brought inside in pots last fall, have begun putting forth flowers in colors that could only have been chosen by a child. Deep red, fuchsia pink, egg yolk yellow sit happily on rosettes of cushiony, kelly green leaves. They’ll be moved into the house to provide instant cheer. 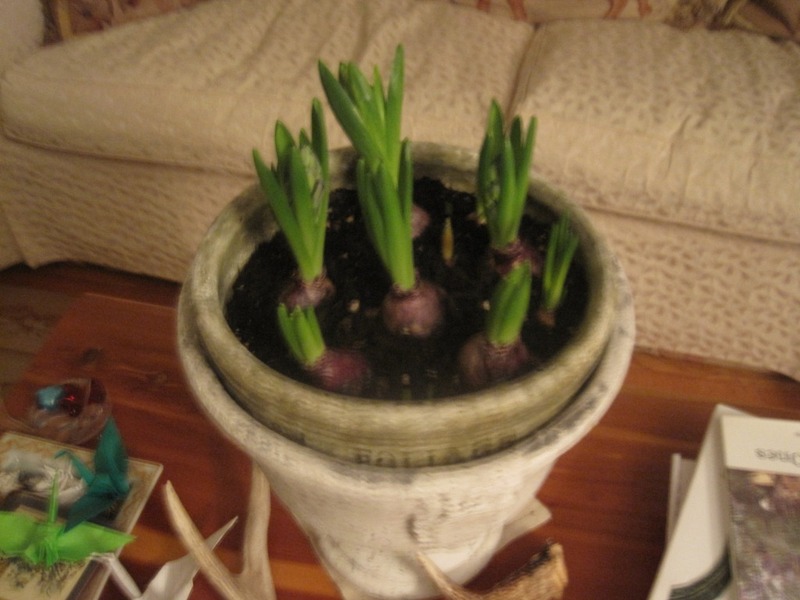 Heralding the hyacinths still breaking through the ground, are the ones being forced indoors. 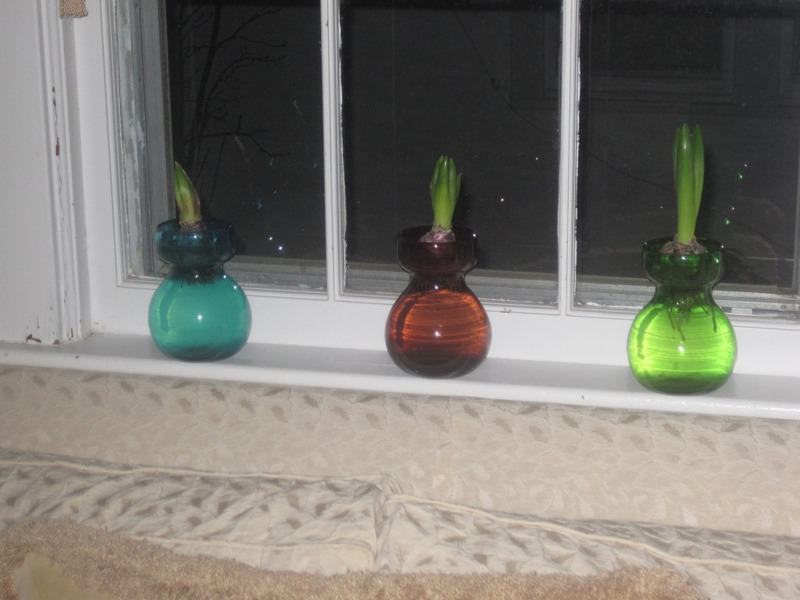 I have placed the forcing vases and pots where not only I, but others will be sure to notice the daily magical transformations. Idealistically I imagine that such gems will improve our moods and outlooks. They do. 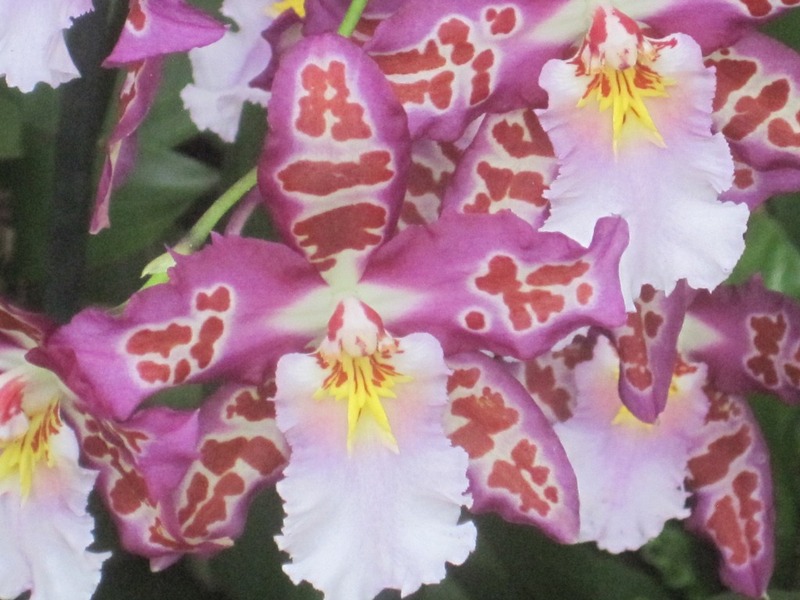 The annual orchid show of the New York Botanical Garden started this past weekend. Like a pilgrim, I went with fervor and faith in my heart. At this time of year, I’d go to just about any floral exhibit. 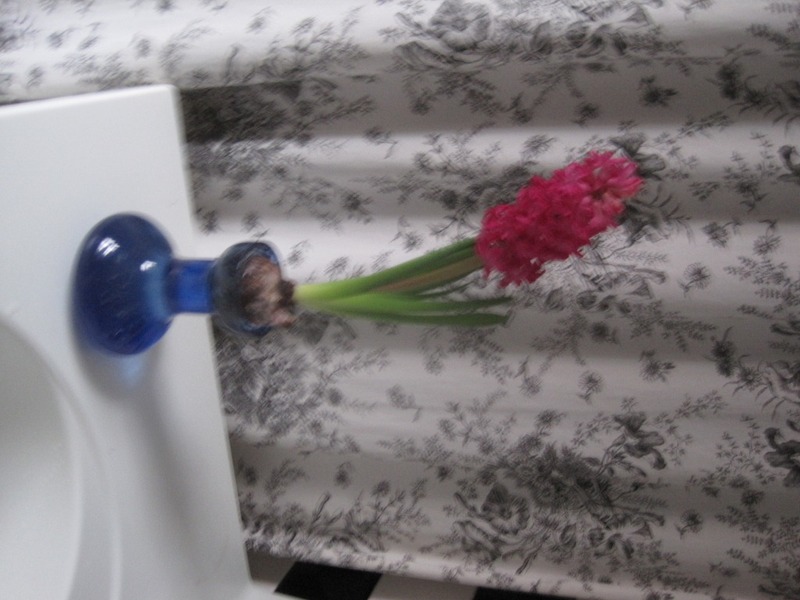 Never mind that the flower shows are not entirely realistic. The sight of a gazillion flowers in bloom is the perfect ticket to banish all traces of the winter doldrums. The more gaudy the splashes of color the better. I am now brimming with renewed energy and desire to serve my garden. As soon as it gets bearable to work outside, I’ll be pruning the roses. 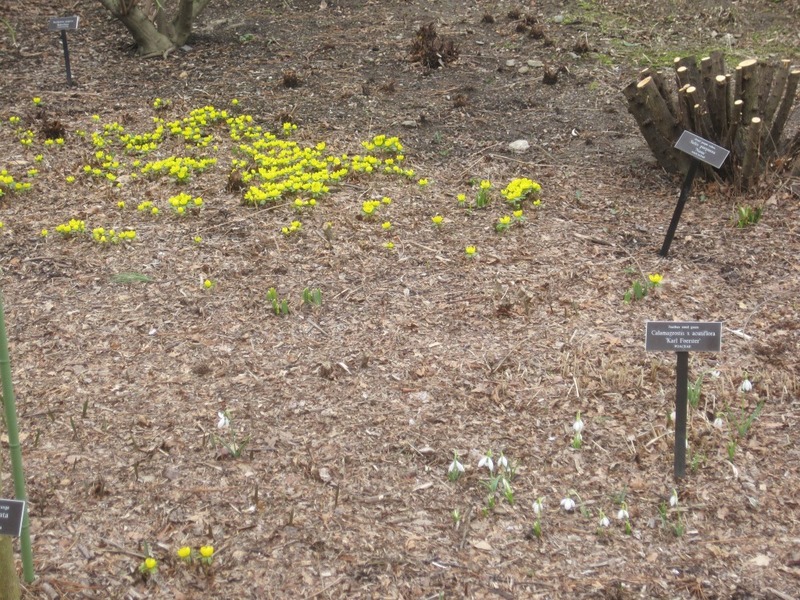 The gardens at the NYBG are always a couple or so weeks ahead of my garden. Surveying the swathes of blooming snowdrops and eranthis, the fully open hellebores and even a few daring crocus, I had a very satisfying preview of the pleasures to come. Is there anything more sublime? Even the light has changed. The soft, pale amber of winter has turned a distinct shade brighter. After we move the hour hand forward on the tenth, we’ll be waking to sun burnished mornings. I cannot wait. I too have awoken from my hibernation. 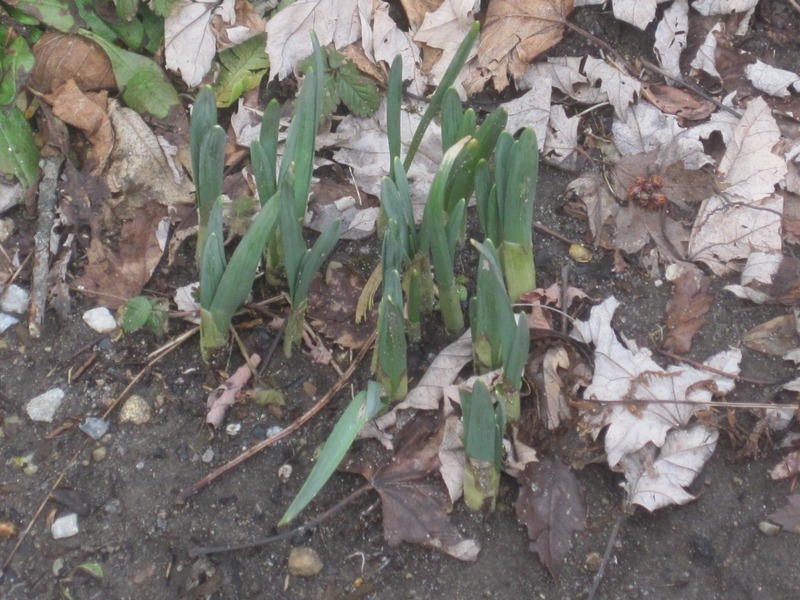 More evidence that spring is imminent.